Fred's new undead life as an abandoned vampire in Winslow, Colorado has been busy and full of trials but he's settled now, having built a family out of the friends he's managed to acquire in recent years. Even Fred's business as a paranormal accountant is booming, causing him to work both and night and day to deliver on his contracts on time. All in all, other than having more business than he can handle sometimes, Fred is pretty content. As the saying goes however eventually every shoe must fall. When a new vampire clan moves into town intent on filling in the power vacuum, Fred must choose between staying and fighting for the life he has built or moving to a town run by fellow paranormals. This is the third installment in the Fred, the Vampire Accountant series. My major concern in the first two books is that they read like a collection of short stories rather than one continuous novel from start to finish. Hayes does much better this time around though at times the he does drift into little side stories that don't have much to do with the main plot. Because I find the idea of a vampire accountant who simply wants to do right by his clients and be with his friends so novel, when the distraction happens, it's easy to just go along for the ride, particularly because the distraction usually comes with some sort of ridiculous nonsense which is laugh out loud funny. It is however worth noting that Blood Acquisitions does have a problem with line editing which might be an issue for some readers. What continues to make Fred, the Vampire Accountant series so fascinating to me is Hayes treatment of gender. Normally in a vampire story, it's the vampire who fits into the role of anti hero and the vampire who is strong enough to induce fear in anyone or anything he meets. Fred, the Vampire Accountant series puts this all out of balance because Fred, with his infamous sweater vests, is never the strongest person in any room and in fact, when the opportunity arises for him to amass more power, Fred turns it down. With the exception of a human female lawyer who Fred absolutely sees as an equal, all the women in Fred's life are significantly more powerful and knowledgeable about the paranormal world than he is. Even Fred's agent girlfriend Krystal, sees it as her job to protect Fred. What I like the most about Fred is his loyalty to his friends and his clients. When the Turva sets up residence in Winslow, Fred quickly finds that he's running out of options. He heads to see a dragon to ask about other vampires and when offered a sample to increase his power or the opportunity to have all of his problems simply whisked away, Fred refuses. It would be so easy for Fred to have all of his enemies killed, thus assuring him that no other group of vampires would try to set up stakes in Winslow for at least a hundred years but Fred instead considers the innocent vampires who would lose their lives. Even when he's about to forced into making an alliance with Turva, essentially making him subordinate to their leadership, Fred refuses to lean on his much stronger friends because he sees that as taking advantage. He's determined to stand on his own two feet come what may. The Fred, the Vampire Accountant series is absolutely about Fred negotiating the parahuman world; however, Hayes has worked hard to create an ensemble cast of characters for Fred to interact with. 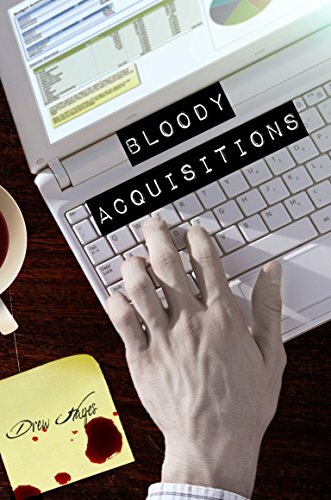 In Bloody Acquisitions, Hayes introduces us to a new bisexual character in the form of Fred's new assistant Lillian. Lillian has an important role to play but her sexuality is revealed in the most convoluted way by referencing the Kinsey scale. I actually had to pause and think about why Hayes went there to understand that he was declaring Lillian to be bisexual. This means that there are now two LGBT characters in this series and while Bubba didn't have a huge role in this story, he certainly appeared more than many of the other side characters. As pleased as I am by the LGBT inclusion, Hayes still hasn't really gotten around to including any characters of colour. It's disturbing because in Blood Acquisitions, Hayes added even more supernatural creatures, thus making this series magically diverse and humanly erased in terms of race. It makes me wonder if Hayes thought he could away with racial erasure because Colorado, according to the U.S. government 87.5% white? Colorado may not have a lot of people of colour but the fact remains they are there and there's no justifiable reason for them to be erased from the story. I love the Fred, the Vampire Accountant series. I love that Fred is awkward and wears a sweater vest. It's a great change from many of the vampire stories I have read and the quirky edge is fun without devolving continually into ridiculousness. Hayes has turned the myth of all vampires being powerful, beautiful and sexually aggressive on its head with Fred, who couldn't be anymore vanilla. Fred is the guy who blends into the background and gets ignored but he inspires loyalty because of his strong moral fiber. Despite Fred's desire to lead a quiet life, Fred invariably seems to find himself in trouble and the most ridiculous situations but because of his ordinary approach to the strange, Fred's story never seems to get boring. This is book three in the series, so do yourself a favor and start at book one if you're looking for a new twist on vampires and then buckle in for the laughs.